My father was born in 1923. His parents named him Shen Bo (申伯) which, in the local dialect means first son in Shanghai. He grew up in a house on Avenue Haig (now called Huashan Lu). This was the westernmost edge of the French Concession. 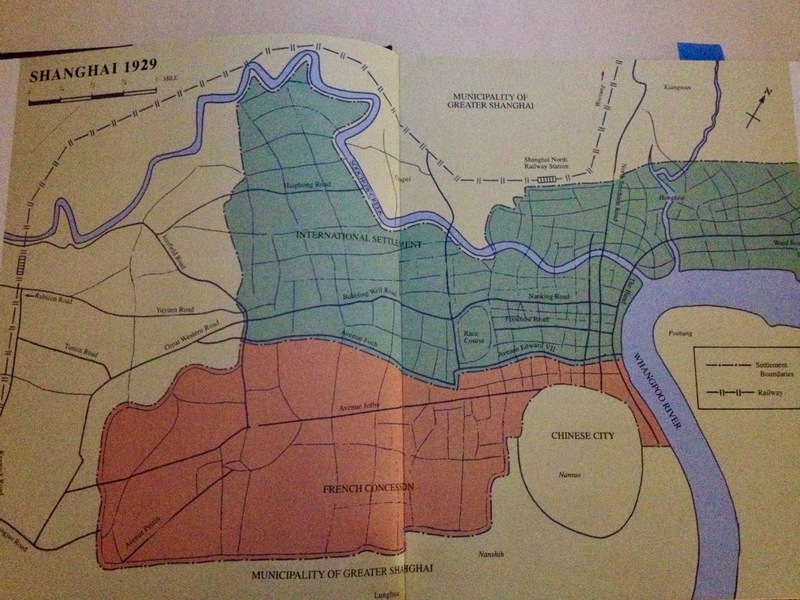 This is a map of Shanghai in 1929, taken from A Last Look: Western Architecture in Old Shanghai, an invaluable source of information and inspiration for me on old Shanghai. The orange lozenge is the French Concession created in 1849. The green behemoth on top is the International Settlement, the result of a merger between the original British (1843) and American (1844) concessions. Last but not least is the little circle to the right. That’s the Chinese City, the original walled settlement of Shanghai from the days when it was little more than a fishing village. Each foreign concession was ruled by its own municipal council and secured by its own police force (Sikhs for the British, Annamites aka Vietnamese for the French). There were separate postal, electricity and telephone networks. When my father was still a child, the house on Avenue Haig was practically in the countryside. He could lie on his bed and listen to the military bands practicing along Jessfield Road. It was a large house with three bedrooms and two bathrooms upstairs. On the ground floor, there was a living room, dining room, family room and solarium. The kitchen and the servants’ quarters were out back. A patio-like structure protected the front of the house and was planted with grapevines for shade in the summer. There were pomegranate, kumquat and peach trees in the garden as well as a variety of vegetables. My grandfather kept his Model T Ford in the garage, next to the rickshaw kept for my grandmother’s private use. She would go shopping every day on Nanjing Road at the great department stores Sincere, Wing On and Sun Sun. 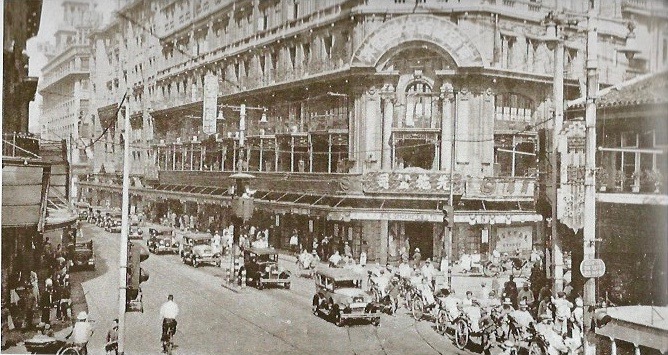 By the 1930’s, Shanghai had changed. The farms to the west of the house were now bordellos and casinos, offering unregulated forms of entertainment throughout the night. Crime was rampant. My grandfather had a stout fence built to keep the riffraff off of his property. During the First Battle of Shanghai in 1932, the Japanese attacked the native parts of the city and burned them to the ground. War had not yet been declared, but to many Chinese that made no difference. Some tried to flee China in those days. And so, according to family myth, my grandfather decided to remodel the house on Avenue Haig. He figured that materials could be scrounged from bomb sites and labor would be even cheaper than normal. And he was sure that the Japanese would never bomb a foreign concession, so that his investment would be safe. The house on Avenue Haig survived the 2nd Sino-Japanese War and the civil war, too. 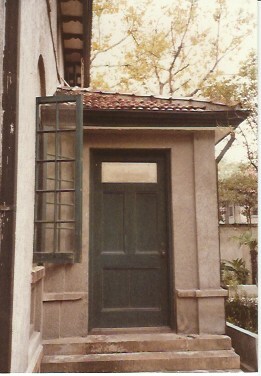 It was still standing when I visited Shanghai for the first time in 1984. The address had changed to 370 Huashan Lu. The old family home was now a call center for taxicabs. My cousin Brenda knew all about the place. Her mother, my father’s only sister, had given Brenda detailed instructions. Recorded in Chinese and English, Brenda knew where all the important family sites were. So one day, she took me to see the house. From the outside, it looked largely intact though the gardens and the stout fence were no longer standing. From the inside, the house was no longer a home. Telephones squawked. Impatient men stood around gesturing at us or maybe at each other. 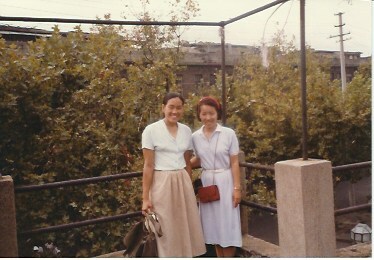 Here we are, my cousin Brenda and I, at what was once the rooftop garden of the house on Avenue Haig. 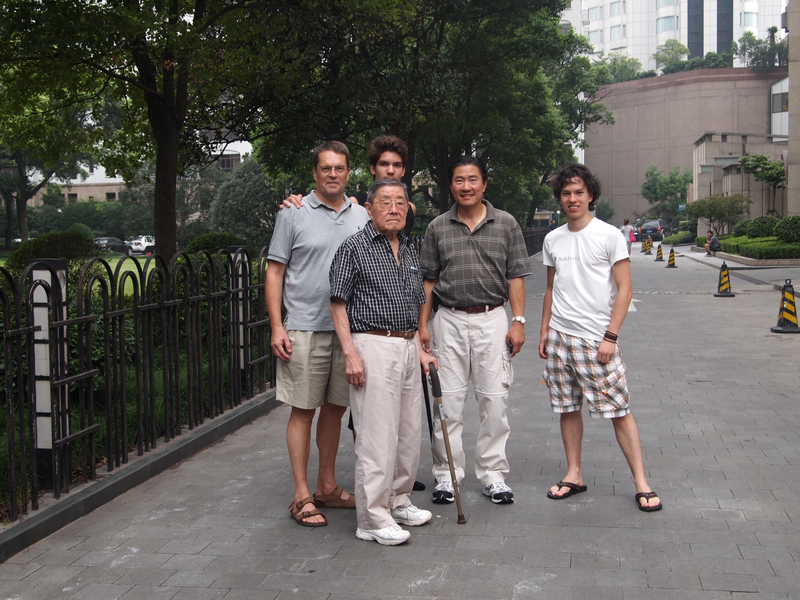 I returned to Shanghai in 2011. This time, my whole family came: parents, spouse, sibling and sons. We went to 370 Huashan Lu. But the house was gone. Developers had razed it and used the land to build a new luxury apartment complex. My father’s house now lay buried somewhere below the driveway into the apartment building complex. Here’s my father, standing at a place that once was home.